HARTFORD, Conn.–(BUSINESS WIRE)–Corbin Advisors, a research and advisory firm specializing in investor relations (IR), today released its quarterly Inside The Buy-side® Earnings Primer report, which captures trends in institutional investor sentiment. The survey was conducted December 5 to 26, 2018 and is based on responses from 85 institutional investors and sell-side analysts globally, representing more than $595 billion in assets under management. Our 4Q18 survey reveals investors have turned decidedly more negative and now believe that, for now, the best days are behind us, as FY 2019 outlooks are expected to be tempered. Investor sentiment and perceived management tone are significantly more cautious, registering at the most negative levels since Sep. 2016, in which concerns centered on China and broader global growth, as well as consumer confidence ahead of the U.S. Presidential election. Despite the worst December U.S. stock market performance since the Great Depression, over 50% of investors still classify U.S. equities as Overvalued and more note they expect further contraction in the first half of 2019. Approximately half expect U.S. and European economies to Worsen over the next six months, a drastic decline for both. 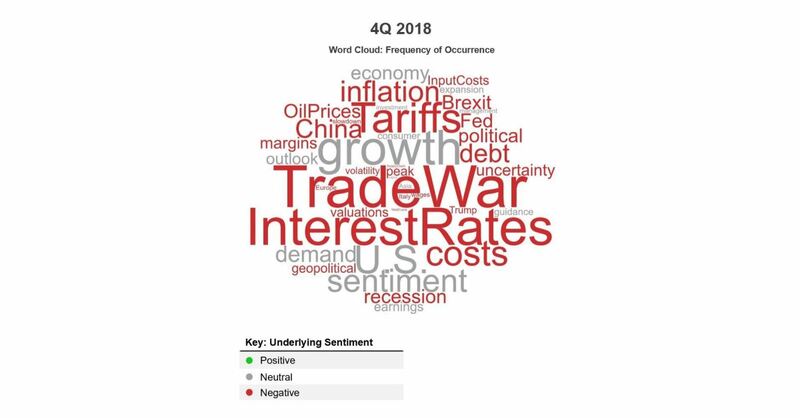 Survey respondents’ downbeat outlook extended to the broader economy, with 59% expressing Continued or More concern with a potential U.S. recession versus one year ago, an increase from 47% last quarter. Meanwhile, headcount reductions in reaction to higher costs and the challenging macro rose sharply in 4Q18, with at least 34 companies announcing more than 115,000 layoffs in total. “It will be important for executives to address growth in the context of risk management strategies, while balance sheet strength and margin preservation will be in focus for investors,” added Ms. Corbin. “Defensive sectors, as well as companies with recession-tested management teams, conservative debt levels and strong operating models will be safe harbors in this volatile period,” said Ms. Corbin. As we noted last quarter, our proprietary research indicates Net Debt-to-EBITDA thresholds continue to grow more conservative, with a preferred level of 2.0x for most sectors, down from 2.5x in 2016. As for sector views, Healthcare remains strong following outperformance in 2018, while Utilities and REITs are no longer the most out-of-favor for the first time in more than two years. Building Products, Consumer Discretionary and Financials led a trend of significant increases in bearish sentiment for most other sectors. Since 2006, Corbin Advisors has tracked investor sentiment on a quarterly basis. Access Inside The Buy-side®&nbsp;and other research on real-time investor sentiment, IR best practices and case studies at CorbinAdvisors.com.